The Lunar Delta RI is a new layout for 2016. It’s an uncommon layout, but well suited to a twin-axle with a front end living area, which can be used as sleeping accommodation and an offside kitchen. 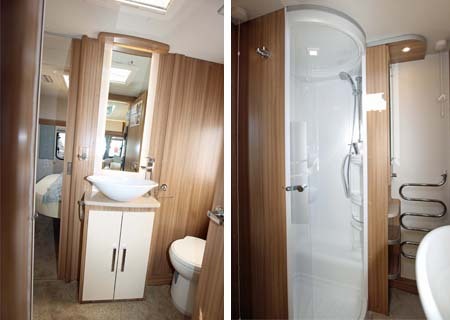 That is where traditional caravan design ends, as the transverse shower room is in the middle of the caravan and the fixed bed is at the rear. 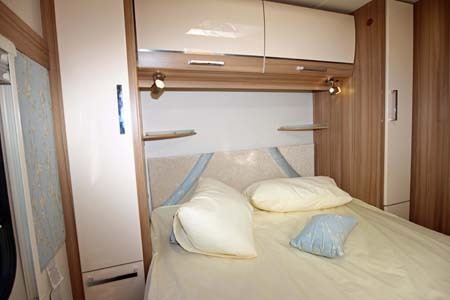 So walking from the rear, the transverse island bed has narrow wardrobes each side of the bed and a dedicated television point on the offside wall. A sliding door leads to the shower room, where the shower with sliding acrylic door is mounted over the wheel arch. There is a stylish new style counter-top mounted washbasin and LED back lighting. The storage in the shower room certainly compensates for the minimalistic storage in the bedroom. A sliding door leads to the kitchen area where there is excellent work space, with a lift-up flap extension. The impressive storage includes shelves, drawers, pullout metal baskets and roof lockers. Culinary accoutrements include a Thetford Aspire oven, grill and dual-fuel hob, a microwave oven and a large capacity fridge freezer. The living and dining area is sumptuous with Meadow Sky curtains (they harmonise with the blinds) and Sarona soft furnishings, which contrast with two-tone cream and high gloss locker doors. 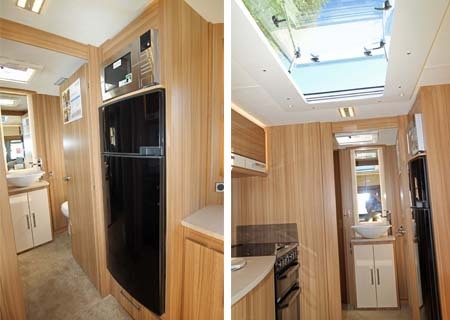 A stunning feature is the new Maxi Skyview rooflight, which on the day we saw this caravan, threw blue sky and sunlight into the interior in abundance. The underslung 40 litre clean water tank with auto-switch over is an added bonus; I know there’s nothing worse than running out of water at a critical point, especially in bad weather. There’s a comprehensive safety and security package including AL-KO AKS stabiliser, two AL-KO Secure Wheel locks, AL-KO ATC, AL-KO jack, Phantom tracker with 12 months subscription, and a new AL-KO Automatic Adjustment Braking System. 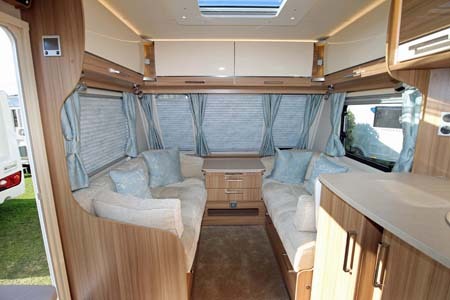 It would be advisable to insure this caravan given its purchase price, and these features are likely to have a favourable impact on your insurance premium. Verdict: The height of luxury for two people. Think Boutique hotels, bijou bedrooms, contemporary living and chill-out days. In the colour scheme that we saw, there’s no way that the younger generation would be allowed the privilege of a weekend away but there is the option of alternative upholstery including “Aquaclean” stain resistant fabric. But I wouldn’t tell them that! Safety & security AL-KO AKS stabiliser, two AL-KO Secure Wheel locks, AL-KO ATC, AL-KO jack, Phantom tracker with 12 months subscription, and a new AL-KO Automatic Adjustment Braking System. 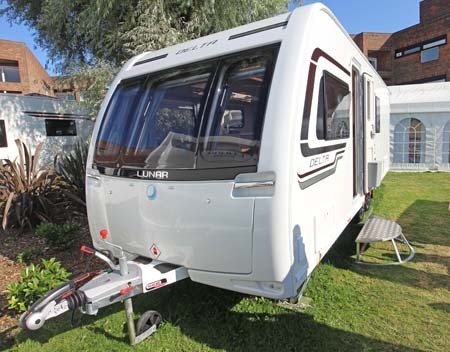 *Caravan insurance cost based on Lunar Delta caravan retailing at £26,199 fitted with Phantom tracking system, hitchlock, two Al-KO secure wheel locks, and AL-KO ATC. Kept on drive at HX4 0BE. Caravanners over 30 years old, claim free for 3 years and a member of a caravanning club. £100 excess. 180 days European cover and up to £75 per day for up to 15 days emergency accommodation cover included. Legal expenses cover, extended European cover and other emergency accommodation expenses cover options are available at extra cost. Quote includes 10% online discount and 9.5% Insurance Premium Tax and is correct as of 16.12.15. **Price is ex-works and includes VAT but excludes a recommended delivery charge of £525.00, including VAT, to cover the cost of additional services e.g. delivery of the caravan to your retailer, before collection by you. Looks amazing. Better start saving I really want to upgrade my lunnar DS. Love that model everything in a perfect place. 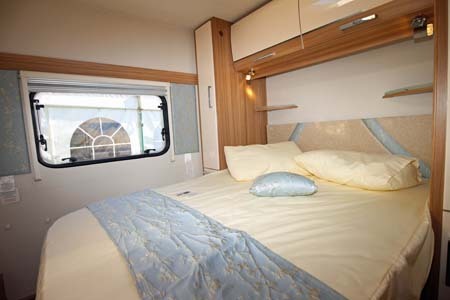 The author’s verdict sums up this luxury caravan, however the photographs of the inside look amateur. The throw, pillows on the bed look as if they were thrown there, the curtains in the lounge could have been arranged neater. Just a small point but nevertheless, there to be seen by all. Thanks Peter. We’ll take that on board for future reviews.